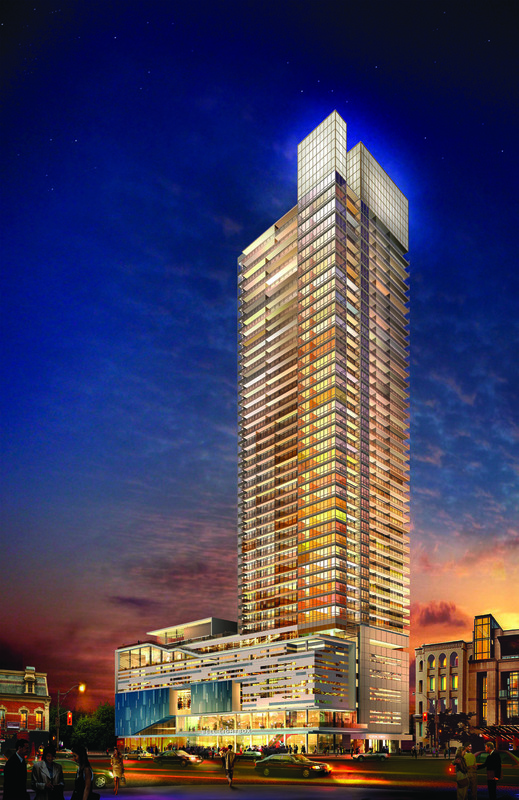 Ladies and gentlemen, only a select few fabulous suites remain at Festival Tower – the incredible condominium situated atop TIFF Bell Lightbox at King and John Streets in Toronto’s new cultural corridor! What an amazing opportunity for film-lovers who want to live in the centre of the action. This phenomenal building is complete, and it is a dazzling addition to Toronto’s Entertainment District. Developed by The Daniels Corporation with the Reitman family, TIFF Bell Lightbox is the celebrated new permanent venue for the Toronto International Film Festival, and Festival Tower is home to residents who are enjoying special year-round interconnectivity privileges with this internationally celebrated centre for film. This film-inspired landmark has led the city’s artistic and cultural revolution since it opened during the September 2010 Film Festival. Living above the Centre offers an opportunity unique in the world. You can see for yourself. Drop by this outstanding building, have a bite to eat in Canteen or Luma, the two fabulous restaurants in the podium, take a stroll through TIFF Bell Lightbox, and experience in person the magic that Festival Tower suite owners appreciate on a daily basis. If you are interested in living in this phenomenal condominium, register now at www.festivaltower.ca, before it’s standing room only.